Objective: Describe the risk of tractor rollovers and effective means to avoid rollovers and minimize rollover injuries. Review the information below on rollovers, ROPS, and means to prevent rollovers. Show workers tractors with ROPS. If possible, demonstrate a folding ROPS for workers. Ask workers to describe any rollovers they have experienced. Tractor rollovers account for 50 percent of tractor-related deaths in the United States. Distracted operators, speed, and rough or uneven ground are leading causes of tractor rollovers. ROPS do not prevent rollovers, but they are 99.9 percent effective in preventing death or serious injury. The Occupational Safety and Health Administration (OSHA) requires ROPS and seat belts to be installed on all tractors over 20 HP operated by employees. Rollover protective structures (ROPS ) became available in the mid 1960s. ROPS were not available for all new tractors until the mid-1970s. However, ROPS were not standard equipment on new tractors until 1985. Many tractors without ROPS are still in use. They contribute to the fatality rate because they are not ROPS and seat-belt equipped. Use of ROPS and seat belts are 99.9 percent effective in preventing deaths due to tractor overturns. Rollover protective frame. Either two or four post frames are securely mounted to the main body of the tractor. Use the provided seat belt to keep the operator within the protected area. Folding ROPS. The top portion of the ROPS folds down so less overhead clearance is needed. This allows access to low-clearance areas like orchards or low overhead doors. Rollover protective enclosure. A rollover protective enclosure utilizes the protective frame but totally encloses the frame with metal and glass. Seatbelts are provided and must be used to contain the operator within the protected area. In addition, a cab enclosure gives protection from weather, dust, chemicals, noise, and vibration. Enclosures on older tractors were designed for operator comfort, not for rollover protection. They are not considered ROPS. ROPS must meet regulations and standards that certify that they provide adequate protection in a tractor rollover. To find out if a frame or enclosure is certified, look for a certification label, contact the manufacturer, or check for the presence of a manufacturer installed seat belt. For tractors not equipped with a ROPS, check with the manufacturer or dealer for the availability of ROPS retrofit kits. If they are available, the tractor should be retrofitted. If kits are not available, the tractor should not be operated. Install and use seat belts on tractors with ROPS. Seat belts ensure that the operator stays within the zone of protection offered by the ROPS during a mishap. Seat belts should not be used on tractors without ROPS. Set the wheels as far apart as possible. Lock the brake pedals together before high-speed road travel. Match speed to operating conditions and loads. Do not let the front wheels bounce. Avoid crossing steep slopes. Watch for depressions on the downhill side and bumps on the uphill side. Turn downhill, not uphill, if stability becomes a problem. Stay 10 feet or more away from ditches and steep slopes. Slow down to maintain control. Stay 10 feet or more from a riverbank. The bank may be steep. Slow down to maintain control. Keep front-end loader buckets as low as possible when moving. If the right front tire goes off the road into the ditch, turn downward or hold steady and slowly recover. Do not attempt to turn sharply back onto the roadway. Always hitch loads at the drawbar. Use front weights to increase tractor stability. Start forward motion slowly and change speed gradually. Back out or be towed out of ditches or mud. Install and use seat belts on tractors with ROPS. 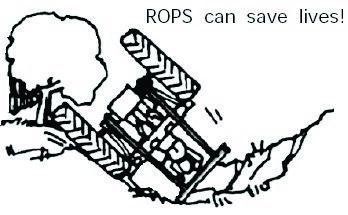 ROPS do not prevent rollovers from occurring. Most rollovers involve tractor speed, operator error, or unsafe driving conditions. Follow safety steps to prevent rollovers.